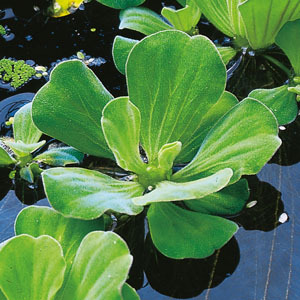 Floating plants are ideal for newly installed ponds, because they absorb CO2 directly from the air. They are growing quickly and make few demands on water quality. Their value is determined particularly by their enormous growing capacity, even under conditions in which oxygen producing plants fail. The floating plant group is not very large, certainly not if we consider just the native hardy species. However, even though there are few of them regarding their species, they are forming a very useful and in some cases essential group of water plants. To realise a natural equilibrium and clear water the plants can not be dispensed with. Their floating power these little plants owe to their leaves that are filled with air, whereas the little roots that are hanging in the water absorb nutrients. 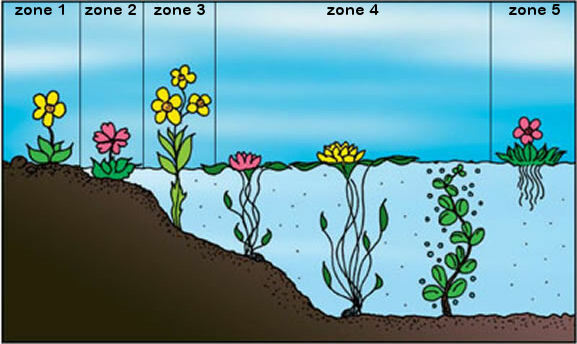 In contradistinction to the group of oxygen plants which are growing under water, floating plants, for their growth, do not have to rely on CO2present in the water. Usable hardy floating plants include, among other things frog bit (Hydrocharis Morsus-ranae), duckweed (Lemna valdiviana), pointed weed (Lemna trisulca) and azolla floating fern or small duckweed fern (Azolla Caroliniana). Non hardy species are, for example, mustard plant or water lettuce (Pistia stratiotes) and floating fern (Salvinia natans). You can use the well during the months of May up to and including September. These subtropical floating plants can hibernate in an aquarium, if necessary. Tropical floating plants, such as water chestnut and water hyacinth may serve as ornamental plants, however, in our climate they have no biological use. If the outside temperature has risen above 15°C is, the plants are strong enough to be put in a pond. At lower temperatures you may let them hibernate in a frost-free area. Floating plants are pre-eminenty suitable then to be into newly installed ponds. You can purchase these useful plants in garden centres and pet and pond specialist shops.